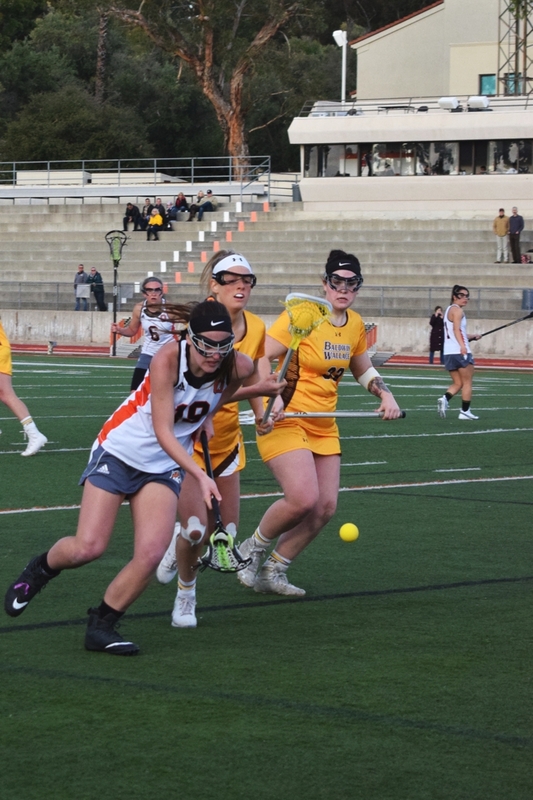 Occidental’s women’s lacrosse team completed the first round of conference games for the Southern California Intercollegiate Athletic Conference (SCIAC) Wednesday, March 6. The team ended the first round with a 3–2 record. This is the first step in achieving their goal to win a SCIAC championship, Neah Bois (senior) said. According to goalkeeper Bois, part of their success is due to their new head coach, Hannah Khin. Khin was previously the assistant coach for the women’s lacrosse team two years ago, which allowed her to take a more assertive role as a head coach. The team’s biggest win was against Redlands Feb. 27, resulting in a final score of 17–6. Bois said Occidental and Redlands have had a huge rivalry for years. Winning this game gave the team a sense of pride because Redlands is a highly competitive, physical rival. From the beginning to the end of the game, the women’s team played aggressively, according to Bois. Defensive player Emma Barrow (junior), Bois and Khin all said the team’s greatest accomplishment was the game against Claremont-Mudd-Scripps (CMS) March 2. CMS is a nationally ranked team and top in their conference. Despite the 6–12 loss, the team felt accomplished because they held CMS to their lowest number of goals this season. At half time, Occidental’s team was down by two. When the second half arrived, they were able to tie the game 5–5, Khin said. According to Barrow, they’ve never come that close to beating CMS. She was proud of her team for being competitive all the way through to the second half, even though it did result in a loss. Part of the reason the women were able to play so competitively against CMS is their support for each other. The group dynamic improves how they play because they listen to constructive criticism, according to Barrow. Everyone has stepped up and is willing to do everything they can to achieve their goal, Khin said. One thing they talk about that will help them reach their goal is constantly holding each other accountable to play and practice hard. According to Bois, they treat each practice like a game, always playing with high intensity and determination. When things get tough in a game, they are prepared and can persevere through the hard moments. Khin has many goals for the team, including helping each player improve, being competitive and, most importantly, having each of the players on the field be a threat. “When every player is a threat, it makes it a lot harder to scout and for other teams to figure out who’s going to dominate the game,” Khin said. 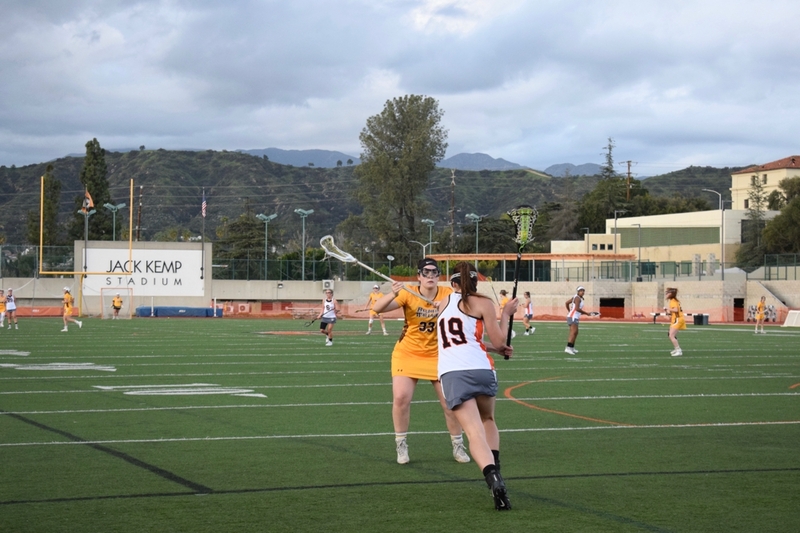 Khin and the women’s lacrosse team want to make it to the SCIAC championship playoffs, which is why they dedicate so much time and energy to practice, according to Barrow. According to Khin, she was excited to join the Occidental women’s lacrosse community because she knows the girls on the team want to be there. The second round of SCIAC games for the team start April 6. Next articleShould Oxy rescind an honorary degree to a racist recipient?